Welcome to the New Russia, built from the agrarian landscape of the time of the Tsars by the miracle metal groznium! It has made all things possible, from the robotic lamps that light our street to the robots that undertake the day-to-day work of our cities, and even the miraculous Class III robots that are our dearest companions. 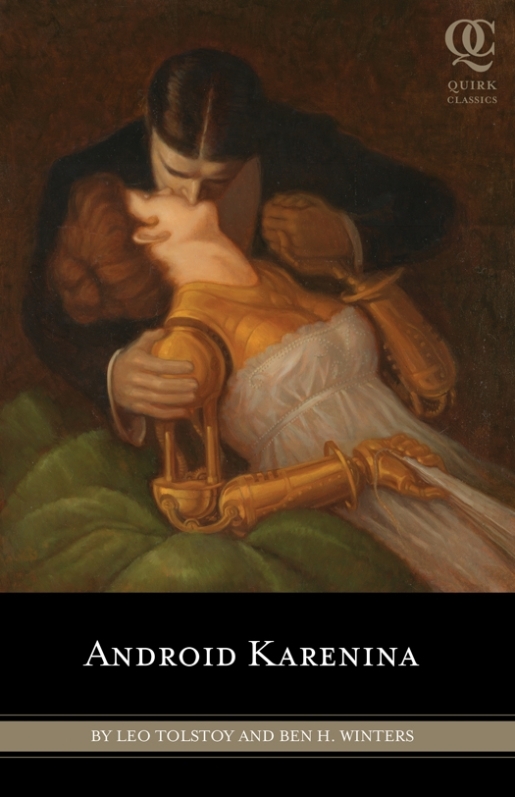 Such is the world of Android Karenina, the latest of the Quirk Classics mash-ups. This time, the aristocracy of Leo Tolstoy’s 1800’s Russia is married to rayguns, aliens, robots, and conspiracies, to wonderful effect! I waited for a long time for this book, I’ve been excited since the cover was released, and I’m glad to see I didn’t get my hopes up for nothing! Ben H. Winters seamlessly blends elements of steampunk and science fiction, gadgets, ray guns, aliens, androids, etc., with the realism of Tolstoy. After the first few paragraphs, you stop marveling at the technology and simply accept it, as it melds seamlessly into the world of Russia’s leisurely aristocracy. The only difference is that, instead of the serfs from the original novel, there are machines that do all the work. It’s a credit to Tolstoy’s characters that their neuroses, idleness, moral ambiguity, and personalities work, no matter how the setting might be tweaked or manipulated by outside forces, and it’s a credit to Ben H. Winters that his additions work with and enhance Tolstoy’s underlying themes, rather than detract from them.